Buzzing hostels within walking distance of the circuit, luxury hotels in the heart of the action, rooms with a view. 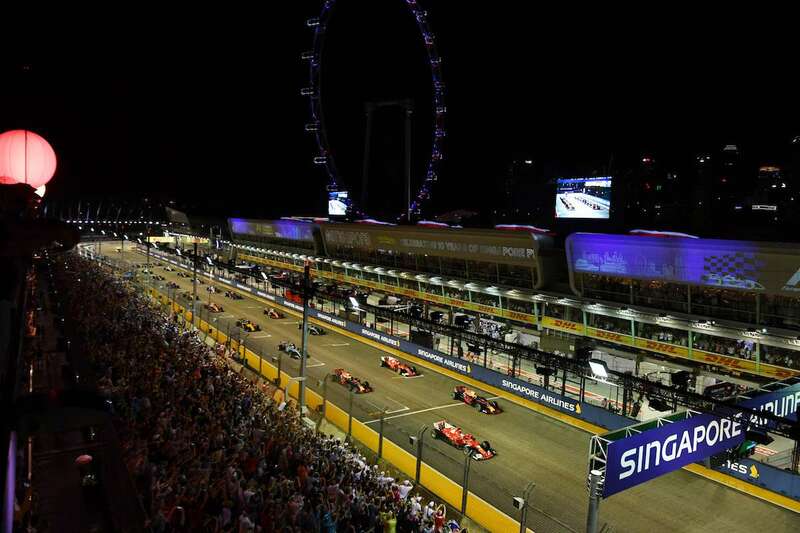 Singapore has it all when it comes to places to stay for the 2019 Singapore Grand Prix on September 20-22. Support the future development of F1Destinations by reserving your accommodation through the Booking.com links on this page. You won’t pay more and we receive a small commission. All images © f1destinations.com. The Swissotel is perfectly located next to turn 9, with easy access to two MRT stations (City Hall and Esplanade.) Rooms on Grand Prix weekend are priced from $650 SGD per night. Located on the inside of the circuit next to turn 6, the Pan Pacific Hotel is an excellent 5-star option. 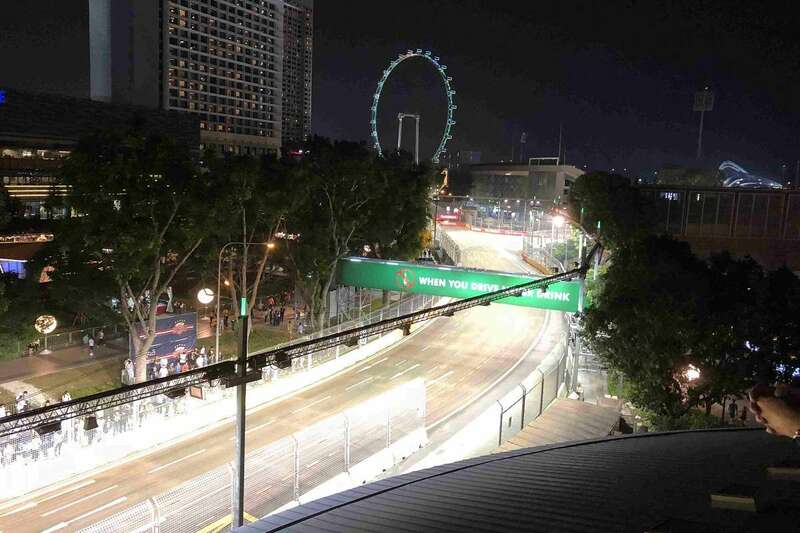 The huge rooms, priced from $700 SGD per night, offer great views of the circuit, Singapore Flyer and skyline. An iconic landmark, the Raffles Hotel is a grand reminder of Singapore’s colonial past. It’s also an incredible 5-star hotel and just a stone’s throw from the Padang area of the circuit. Rooms from $1200 SGD per night. 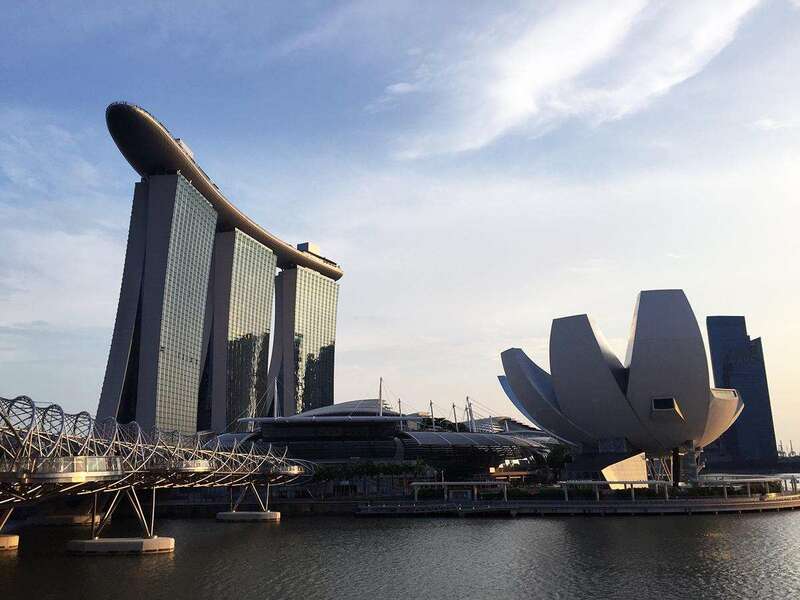 Singapore’s newest architectural landmark, the Marina Bay Sands Hotel and Casino is comprised of three towers connected by an incredible rooftop infinity pool. Some rooms have circuit views. From $825 SGD per night. Get close to the action at the Mandarin Oriental, of the best five-star Grand Prix hotels in Singapore. The hotel is located in Zone 3 of the circuit near the popular Bay Grandstand (between turns 16/17 and 18/19). Rooms from $1100 SGD per night. The ultimate Grand Prix hotel experience. Located next to turns 19 and 20 and only a few minutes walk from the pits, it also hosts the weekend’s most exclusive party, The Podium Lounge. Rooms are priced from $1825 SGD per night. Decent mid-range hotels abound in Singapore, though you will have to be ready for the possibility of windowless rooms in centrally located hotels (especially those in narrow “shophouse” buildings around Boat Quay and Chinatown.) 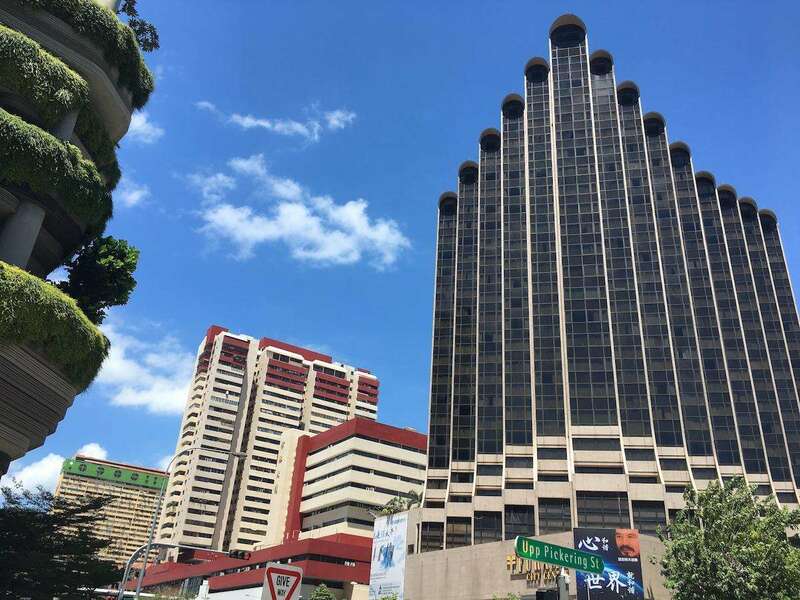 Alternatively, you can look a little further from the city center for better value, but be sure to check your hotel is close to an MRT or bus station so you’ll be able to easily get to the circuit. In 2018, we stayed at the Winsland Serviced Suites by Lanson Place, near Orchard Road. Studio apartments were priced around $250 SGD per night – the rooftop pool was awesome. Recommended! Close to Little India, the Parc Sovereign Hotel is close to two MRT lines (about 10 mins walk) and offers free WIFI and an outdoor rooftop swimming pool. Double or twin room from $150 SGD per night. A good 4-star hotel close to Chinatown and above the Outram Park MRT station. 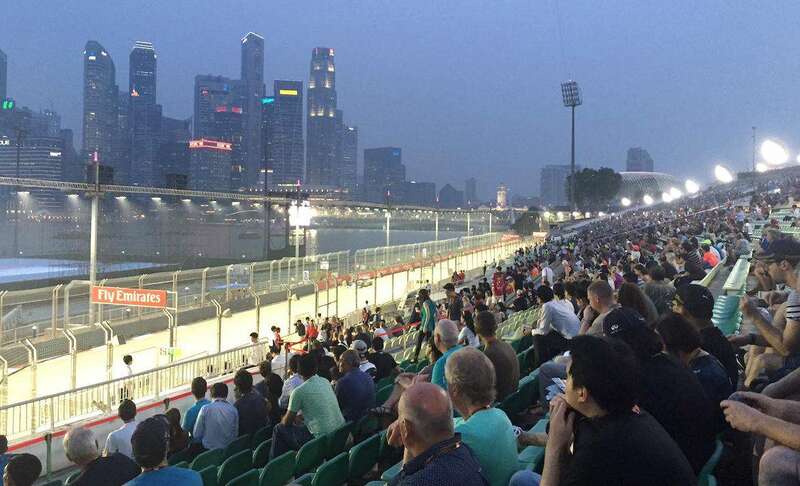 The Marina Bay circuit is just 2.5km to the northeast. Standard double/twin room for $240 SGD per night. A brand new chain hotel close to Clarke Quay (700m from the MRT station) and Chinatown and within walking distance of the circuit. Rooftop fitness center and swimming pool. Rooms from $250 SGD per night. Budget hotels are concentrated in several areas throughout the city, including Chinatown, Little India and Geylang, the city’s red light district. Be aware that many rooms in centrally located budget hotels are windowless, especially those in narrow historic “shophouse” buildings. The budget hotel market in Singapore is dominated by chains such as Fragrance and Hotel 81. Don’t expect luxury or great service – these are very basic hotels with tiny rooms and cheap prices. The location in Geylang may be a little seedy, but an MRT station is nearby for easy access to Changi airport and the circuit. Small, basic rooms are priced from $100 SGD per night. Located in Little India, Hotel 81 Rochor is close to shopping and dining and a 10-minute walk from the Bugis MRT station. Standard double/twin room for $120 SGD per night. 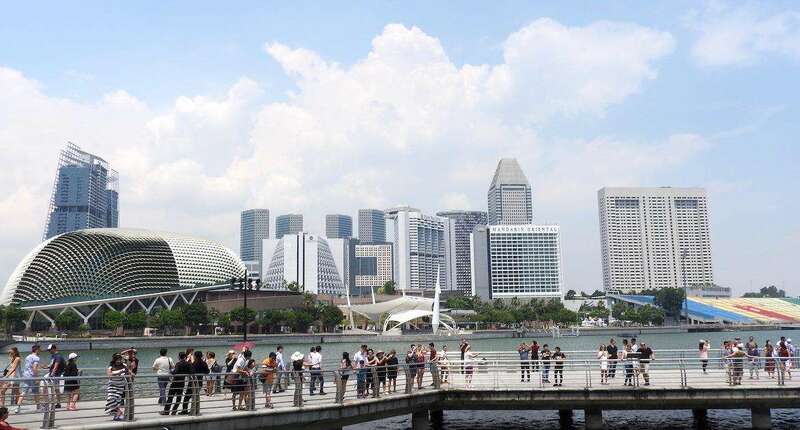 Singapore has a wide selection of good-quality hostels, many of which are located in Chinatown, within walking distance to the circuit and plenty of nightlife options. A little further away, Little India also has a good selection of cheaper hostels. Capsule hotels are a very Asian phenomenon, somewhere between a hostel and a hotel, offering guests a small private space. Great location on Lavender Street in Chinatown, within walking distance of the circuit and popular nightlife areas. Single beds in air-conditioned dorms cost from $40 SGD per night; pods also available. Part way between a hostel and a capsule hotel, the Adler (pictured above) is a new premium hostel. Dorms feature ‘personal sleeping spaces’ and cost approx $80 SGD per person per night including breakfast. A new premium capsule hotel, The Pod is a little further from the track but close to the city’s Arab Quarter. A capsule for one person costs from $100 SGD per night including breakfast. 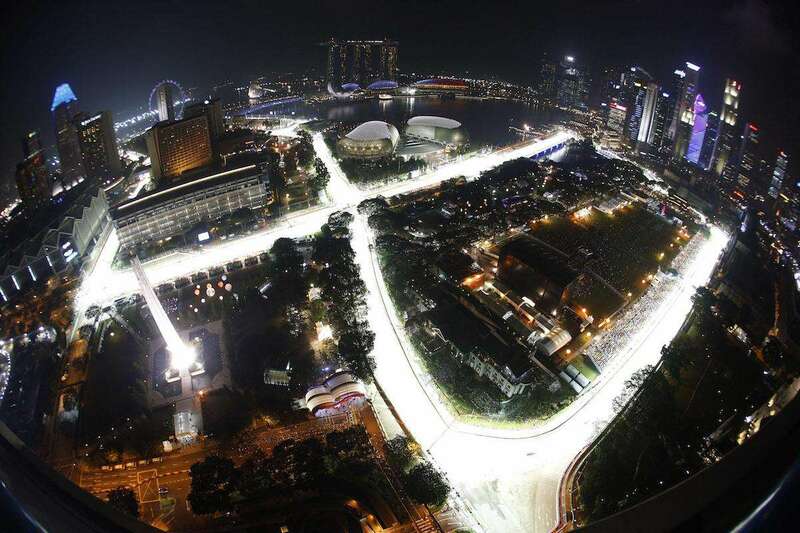 Where is your favorite place to stay for the Singapore GP? Leave a comment. An amazing and detailed explanation, Andrew! Thank you so much for this! I was searching for such a similar list from few days. I am glad that I came across this and got such a good list. Thank god i found your website! goodjoob :) any ideas where usually the hotel of all the F1 team also the drivers stay? Hi Jim. Most teams stay very close to the F1 paddock, in either the Pan Pacific or Mandarin Oriental. Perhaps some teams also stay in Marina Bay Sands. What’s the best/nearest hotel to stay at if I’ll be watching the GP at the main grandstand? Hi Andrew how far is the Amara hotel from the grand prix many thanks . Hi Jenny, depends which part of the track! It’s 15 minutes walk to Padang, where the big concerts are held, and about 30 minutes to Zone 1/Main Straight. Or you could take the metro 1-2 stops. It’s all very convenient!